With this Blog post, we begin a journey through many postings, that will start with the very beginning of forklifts and provide a complete introduction to this product and technology. It is our hope, that through these posts, you the reader will become more informed as a forklift operator or forklift owner on the history, types, and functions of this great product. Today we begin with the beginning and how man has always looked for easier ways of accomplishing difficult strenuous tasks./One can easily think back to the Stone Age man and the invention of the lever. It was Archimedes who finally recognised the importance of the lever and his famous statement “Give me but one firm spot on which to stand and I will move the earth” is well known. We doubt that he was thinking of modern day fork lifts when he said that and indeed it was to be many years before they were developed in the United States. California forklifts evolved from hoists, which were the primary means of lifting and moving heavy items in the late 1800s. These hoists, essentially chains and winches, gave way to wooden platform trucks around the turn of the 20th century. Soon after, the wooden trucks and their trailers incorporated electric motors and traction batteries. A practical and popular machine for moving products over short distances is the lift truck or forklift, one of the most important, yet overlooked, industrial innovations in modern times. Today, over 150,000 forklifts are delivered to material handling buyers each year. Early lift truck models were quite simplistic, with no hydraulics or even forks. These early pieces of equipment were designed to lift a load only a few inches, so chains and human power were usually enough to move a load just a few feet. Even with the limited lifting capacities, these machines made the unloading and loading of freight much easier and more efficient, which became even more necessary during the labor shortage caused by the war..
What is generally credited as the forerunner of the seated counterbalanced truck was produced by Clark in 1917. Known as a Tructractor, it was originally developed solely for use in Clark’s axle plant, but visitors saw its practicality and requested their own models. Then in 1920, the first industrial truck to use hydraulic power to lift its load was introduced. In 1923, Yale produced the first electric truck with raising forks and an elevated mast, today considered the first fork lift truck. The lift worked via a ratchet and pinion system. The new forklift trucks did not immediately surge in popularity, but a major breakthrough occurred with the development of the standardized pallet in the late 1930s. The pallet allowed loads to be stacked uniformly and led directly to the increased development of the forklift. By the 1950s, it became clear that more efficient storage methods were needed, and warehouses began to expand upward rather than outward. Thus, more powerful and more maneuverable forklifts were required. New models could fit into narrower aisles and lift materials up to 50 feet above the ground, higher than ever before. Narrow aisle forklifts helped revolutionize the warehousing industry, as more shelving could be placed into the same space. With the increased lift heights came legitimate safety concerns. Objects that fell from those heights could very easily injure lift truck operators. 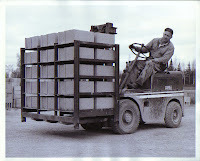 By the late 1950s and early 1960s, forklift manufacturers began to offer options for load backrests and overhead guards. These items eventually became standard, yet the issue of forklift safety continues to be a major concern even today. Operator restraint systems were made standard in the early 1980s, and forklift safety remains an important engineering concern today. New developments in truck and load balancing technology keep vehicles from tipping over. In addition to safety innovations, lift trucks are changing in other ways. Environmental and emissions concerns have led to the development of different types of engines. Power sources for trucks continue to evolve from battery power to electricity to propane to compressed natural gas, among others. Hydrogen fuel cells are on the horizon, and in 2000, a prototype was constructed using fuel cells as a source of driving power in a forklift truck. Hi there. I am from California. I am looking for the truck rental around that region. Please share some truck rental firms. Thanks you. The forklift looks like a very old machine, but it's still a new thing. I don't know how but these forklifts are still gettin' upgraded and they look great. Lift trucks are equipped with balanced systems to avoid tipping over.